MAXFLO DD Series downdraft tables are industrial grade and designed to offer 250 FPM downdraft velocities. This downdraft velocity draws contaminates downward out of the worker's breathing zone without hindering the worker's movement or productivity. MAXFLO downdraft tables have vertical cartridge filters that provide low air to cloth ratios which translates to high efficiency and longer filter life. Our downdraft tables feature reverse pulse cleaning that cleans the filters while they are in the unit, eliminating messy filter maintenance. MAXFLO-DD downdraft tables offer four standard size tables with custom sizes available. Our tables are design to exceed OSHA standards, offer quiet operation, ship fully assembled and ready to plug and play. Typical downdraft table applications are welding, cutting, buffing, deburring, grinding, mixing, sanding, etc. Made in USA. 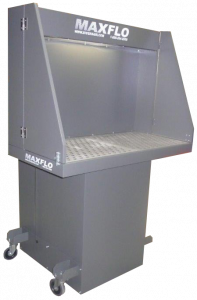 MAXFLO DB Series downdraft tables now offers an easy to use portable downdraft booth. The MAXFLO-DB downdraft tables are an economical and totally self-contained portable filtration unit. Standard filtration consists of an aluminum mesh pre-filter followed by a MERV 14 (95% @ 1 micron) box filter. Optional HEPA and carbon modules are available. Separate access door allows for easy access to filters. 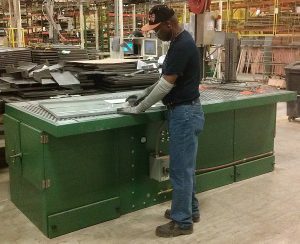 Typical downdraft table applications are: welding, grinding, sanding, dust, powders, and mist collections. 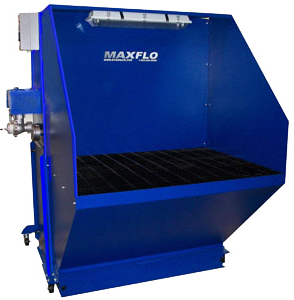 The MAXFLO-Power Bench downdraft tables are designed to provide efficient, cost effective control of dust, smoke, fumes, and gas/vapor contaminants generated from a variety of manufacturing and process applications. Downdraft tables are typically used for control of moderate to heavy concentrations of dry contaminants, the PB series downdraft tables can be used for grinding, sanding, welding, polishing, and dry buffing, etc. The self cleaning systems can be either manual or automatically controlled to minimize maintenance and reduce replacement filter costs. The MAXFLO Powered Bench downdraft tables will help with compliance to local OSHA regulations by drawing contaminants away from the operator's breathing zone. 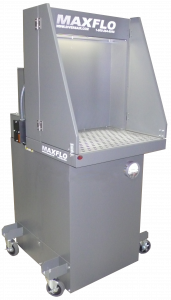 The MAXFLO-Powered Bench unit comes standard with flame retardant filter cartridges, TEFC motor with non-overloading direct drive blower, dust drawer, and tool-less filter access door. Standard downdraft table top sizes are 42"x50", 42"x76", and 48"x102" and provide 360 degree operator access. Downdraft able top air velocities range from 175-275 feet per minute. Custom sizes available.